In a newly published study, Stanford researchers describe a biological transistor that is made from genetic material (DNA and RNA) in place of gears or electrons. When Charles Babbage prototyped the first computing machine in the 19th century, he imagined using mechanical gears and latches to control information. ENIAC, the first modern computer developed in the 1940s, used vacuum tubes and electricity. Today, computers use transistors made from highly engineered semiconducting materials to carry out their logical operations. “Transcriptors are the key component behind amplifying genetic logic — akin to the transistor and electronics,” said Jerome Bonnet, PhD, a postdoctoral scholar in bioengineering and the paper’s lead author. The creation of the transcriptor allows engineers to compute inside living cells to record, for instance, when cells have been exposed to certain external stimuli or environmental factors, or even to turn on and off cell reproduction as needed. “Biological computers can be used to study and reprogram living systems, monitor environments and improve cellular therapeutics,” said Drew Endy, PhD, assistant professor of bioengineering and the paper’s senior author. In electronics, a transistor controls the flow of electrons along a circuit. Similarly, in biologics, a transcriptor controls the flow of a specific protein, RNA polymerase, as it travels along a strand of DNA. “We have repurposed a group of natural proteins, called integrases, to realize digital control over the flow of RNA polymerase along DNA, which in turn allowed us to engineer amplifying genetic logic,” said Endy. Using transcriptors, the team has created what are known in electrical engineering as logic gates that can derive true-false answers to virtually any biochemical question that might be posed within a cell. They refer to their transcriptor-based logic gates as “Boolean Integrase Logic,” or “BIL gates” for short. Transcriptor-based gates alone do not constitute a computer, but they are the third and final component of a biological computer that could operate within individual living cells. Despite their outward differences, all modern computers, from ENIAC to Apple, share three basic functions: storing, transmitting and performing logical operations on information. Last year, Endy and his team made news in delivering the other two core components of a fully functional genetic computer. The first was a type of rewritable digital data storage within DNA. 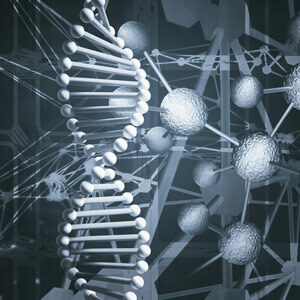 They also developed a mechanism for transmitting genetic information from cell to cell, a sort of biological Internet. It all adds up to creating a computer inside a living cell. Digital logic is often referred to as “Boolean logic,” after George Boole, the mathematician who proposed the system in 1854. Today, Boolean logic typically takes the form of 1s and 0s within a computer. Answer true, gate open; answer false, gate closed. Open. Closed. On. Off. 1. 0. It’s that basic. But it turns out that with just these simple tools and ways of thinking you can accomplish quite a lot. “AND” and “OR” are just two of the most basic Boolean logic gates. An “AND” gate, for instance, is “true” when both of its inputs are true — when “a” and “b” are true. An “OR” gate, on the other hand, is true when either or both of its inputs are true. In a biological setting, the possibilities for logic are as limitless as in electronics, Bonnet explained. “You could test whether a given cell had been exposed to any number of external stimuli — the presence of glucose and caffeine, for instance. BIL gates would allow you to make that determination and to store that information so you could easily identify those which had been exposed and which had not,” he said. By the same token, you could tell the cell to start or stop reproducing if certain factors were present. And, by coupling BIL gates with the team’s biological Internet, it is possible to communicate genetic information from cell to cell to orchestrate the behavior of a group of cells. “The potential applications are limited only by the imagination of the researcher,” said co-author Monica Ortiz, a PhD candidate in bioengineering who demonstrated autonomous cell-to-cell communication of DNA encoding various BIL gates. To create transcriptors and logic gates, the team used carefully calibrated combinations of enzymes — the integrases mentioned earlier — that control the flow of RNA polymerase along strands of DNA. If this were electronics, DNA is the wire and RNA polymerase is the electron. On the technical side, the transcriptor achieves a key similarity between the biological transistor and its semiconducting cousin: signal amplification. With transcriptors, a very small change in the expression of an integrase can create a very large change in the expression of any two other genes. To understand the importance of amplification, consider that the transistor was first conceived as a way to replace expensive, inefficient and unreliable vacuum tubes in the amplification of telephone signals for transcontinental phone calls. Electrical signals traveling along wires get weaker the farther they travel, but if you put an amplifier every so often along the way, you can relay the signal across a great distance. The same would hold in biological systems as signals get transmitted among a group of cells. To bring the age of the biological computer to a much speedier reality, Endy and his team have contributed all of BIL gates to the public domain so that others can immediately harness and improve upon the tools. “Most of biotechnology has not yet been imagined, let alone made true. By freely sharing important basic tools everyone can work better together,” Bonnet said. The research was funded by the National Science Foundation and the Townshend Lamarre Foundation. 1 Comment on "Study Describes a Biological Transistor for Computing Within Living Cells"